His family had been waiting by his side for DAYS. 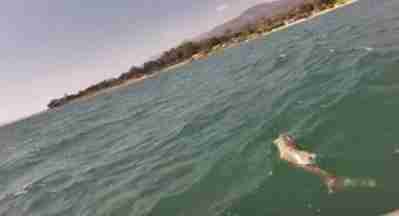 A paddleboarder off the coast of Santa Barbara, California, glimpsed someone struggling in the water on Saturday - closer inspection revealed a baby bottlenose dolphin fighting for his life in a fishing net. By the time rescuers from Channel Islands Marine & Wildlife Institute (CIMWI) arrived on Sunday, the baby was surrounded by adult dolphins who were too scared to let people get close. It's believed that the concerned adult dolphins stayed by the baby for days. So, rescuers used a pole to lift the 70-pound baby out of the water so they could disentangle him. 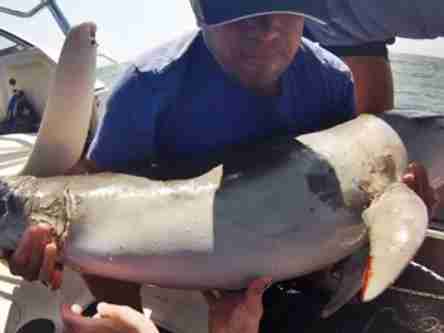 "Netting ... was wrapped around the dolphin's mouth, both pectoral fins, the body, tail, and was trailing 6 feet behind the animal and impeding the dolphin's ability to swim," CIMWI wrote. 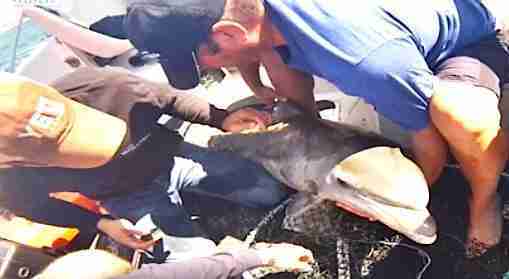 Rescuers worked quickly to free the 2-month-old dolphin from the netting so he could swim back to his family. Even though he was scarred by some debris, veterinarians thought it best to reunite him with his mom as soon as possible, rather than take him elsewhere for rehabilitation. "The baby dolphin was returned back to the water immediately after it was freed from the netting," CIMWI wrote. 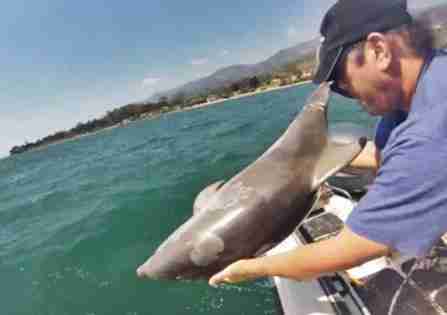 After the baby dolphin plunged back into the water, he knew he was back where he belonged. 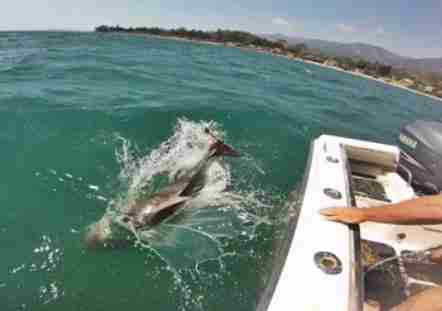 "He was seen swimming towards his mother and the other dolphins in the pod," the group wrote. Click here to follow the rescue work CIMWI does on Facebook.